Beautifully engraved certificate from the Banco Central Mexicano issued in 1908. This historic document has an ornate border around it with with images of a lake, woman, eagle and much more. This item is hand signed and is over 109 years old. Banco Central Mexicano, a private bank, acted as the Mexico City correspondent for state banks. State banks were prohibited from establishing branches outside states or regions under Mexican bank law. In contrast, the two so-called city banks (which were headquartered in Mexico City) faced no branching restrictions. 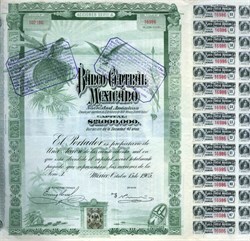 The Banco Central System, a bank note par redemption and clearing system for other payments operated in Mexico from 1899 until its collapse in 1913. The Banco Central System was devised to be a mechanism through which state banks could extract rent from the two large city banks. It has been alleged that fraud and mismanagement by state banks were responsible for the problems the Mexican banking system experienced after 1907. For par redemption to have been viable, the Banco Central System had to have imposed some constraints on bank behavior. Although Banco Central was less well-positioned to address incentive problems relative to one of its successful counterparts in the United States (the Suffolk Bank of New England), it acted like a private bank.